Separated from his mother at an early age, Billy now jumps around from foster home to foster home due to his questionable behavior. However, although he misbehaves at times, he still has a good heart. This is most evident early in the film when Billy stands up for his new foster home brother, and eventual best friend, Freddy Freeman. His pureness of heart causes him to be summoned in front of a wizard, who tells him he is the last hope, as others have failed before him, to prove that they deserve the power of Shazam. This includes the villain of the film Dr. Sivana, who 45-years prior had proven to be unworthy of the powers of Shazam and has vowed to return and take the powers. 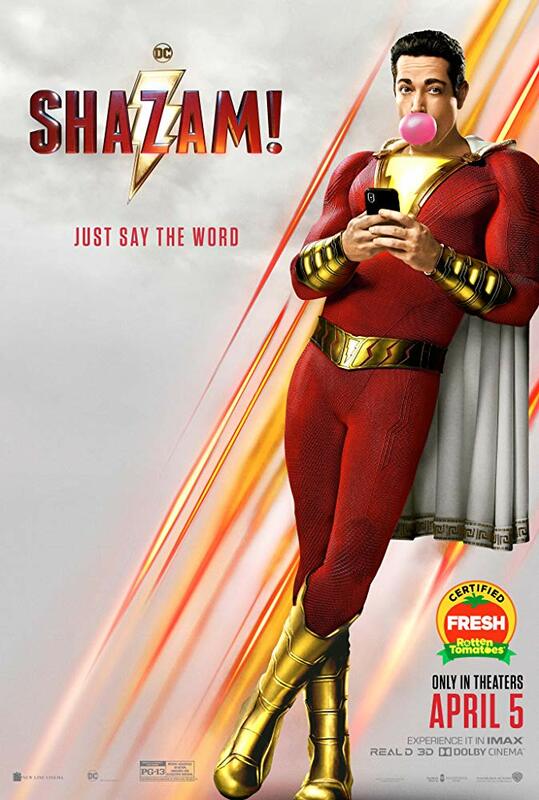 “Shazam!” stars Zachary Levi (adult) and Asher Angel (child) as the hero of the story, Shazam/Billy Batson, and Mark Strong as the villainous Dr. Sivana. Jack Dylan Grazer and Djimon Hounsou also have supporting roles in the film, directed by David F. Sandberg. The best thing about this movie is the message it sends about family and watching those relationships on screen. The moment Billy first gets his powers and the audience watches him, with the help of Freddy, try to learn what his superpowers are, will be the highlight of the film. Freddy is also a standout in the film; when he is on screen you will find yourself smiling from ear to ear. The whole cast is great, and you can tell how much fun they had making this movie, which will rub off on the audience. It is also very reminiscent of the movie “Big”, and like that movie, this one does a great job of showing that although looking like an adult, it really is just a kid on the inside. On the negative side however, the villain is a little weak and feels like a different villain should have been used for this movie. It felt as though he was being directed like he was in a different movie. That is nothing against Strong, as he did a great job with what he was given. As for the special effects, they aren’t great. Superhero movies have been amazing recently with their special effects and I don’t think this one lives up to those expectations. I would highly recommend going to see this movie in theaters; that will maximize the viewing experience. Everyone in the theater will be laughing and enjoying themselves from start to finish and that is an experience you won’t want to miss out on. Make sure to stay through the credits, as the end sets up the sequel and includes more footage of Billy trying to figure out his powers.